Dell does not produce its own display panels, but when it comes to unique “world’s first” monitors, it is sometimes years ahead of all of its rivals. 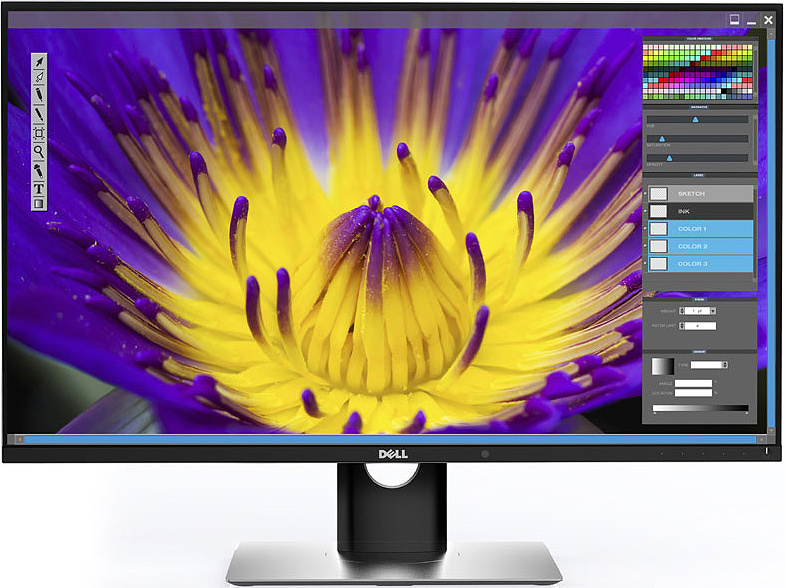 At the International CES 2016, Dell introduced its UltraSharp 30-inch OLED display, the company’s first monitor to use organic light emitting diode panel. The product is designed for professionals and carries a rather extreme price tag, but this is going to be a dream display for years to come. The Dell UltraSharp UP3017Q is a 30-inch display with 3840×2160 resolution, 0.1 ms response time and an unknown refresh rate (yet, it should be very high). The monitor can reproduce 1.07 billion colors, it covers 100% of Adobe RGB color space as well as and 97.8% of DCI-P3 color space (used for digital movie projection by the U.S. movie industry and is expected to be adopted in televisions and in home cinema), according to Dell. Just a few professional displays nowadays cover 100% of Adobe RGB. The manufacturer declares 400,000:1 dynamic contrast ratio, but admits the value is only that because testing equipment won't go higher. The UltraSharp UP3017Q ultra-high-definition display has very narrow bezels; the monitor itself is thin, but not remarkably thin like OLED TVs, possibly because it features internal power supply unit as well as complex logic inside. The monitor features a mini DisplayPort (mDP) connector, an HDMI port as well as a USB type-C port, which could be used for video and data connectivity as well as for power delivery (it can be powered using a type-C cable, or deliver power to another device). Emissive electroluminescent layer in organic light-emitting diode is made of organic compound that emits light in response to an electric current. The organic semiconductor layer is situated between two electrodes and does not require a backlight. As a result, it can display truly deep black levels, unlike liquid crystal display (LCD) panels, which use various kinds of backlighting. Besides, since the emissive electroluminescent layer is very thin and can take different shapes, it is possible to build ultra-thin and even curved monitors and TVs using OLEDs. While OLED technology can deliver deep blacks, high contrast ratio and exceptional colours, it is not free of drawbacks. The organic layer may burn down over prolonged amount of time, and colors can shift over time. To maximize lifespan of the OLED panel inside the UltraSharp UP3017Q, Dell integrated a special presence detector into the front panel of the display, which switches the monitor off when nobody uses it. Another disadvantage of OLEDs is a possibility of static image burn in. To reduce the chance of burn in, the UP3017Q has a special pixel-shifting technology. The Dell UltraSharp 30 OLED monitor will cost whopping $4,999, which it becomes available on March 31, 2016, in the United States. The display at this point is only aimed at professionals, who work in color-critical environments such as graphic arts and photography. However, due to exceptional colors and contrast as well as ultra-fast response time, the UltraSharp UP3017Q will be a dream display for gamers, prosumers and other users, who value quality. OLED panels are considerably more expensive to produce than modern LCD panels, partly because of lower yields. Last year an executive from LG Electronics said that yields of OLED panels had reached 80% and would continue to grow. At the International CES 2016, Kwon Bong-suk, the head of LG’s TV business, said that the company had cut prices of OLED TVs in the U.S. by 45% late in 2015. As a result, LG now expects sales of OLED televisions to triple this year. Price reduction of OLED TVs indicates that production costs of organic light-emitting diode panels are going down. Perhaps, over time, the Dell UltraSharp UP3017Q will also become more affordable, or Dell will release an OLED display for a wider audience.